Here is a preliminary ECU pin out based on the manual and ECU pin labels. 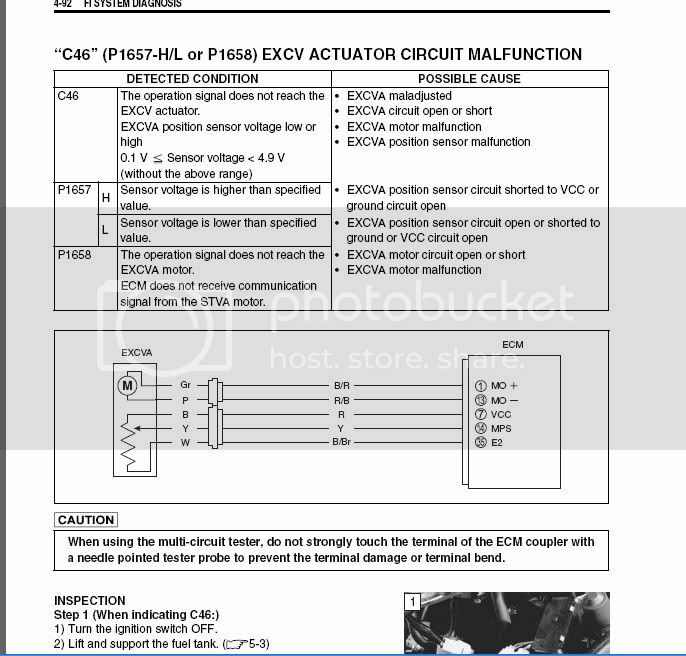 One complaint I've always had with the Suzuki manual is they don't show the ECU pin numbers in the schematic and they don't show the wire colors in the ECU pin description. So here it is all in one document. Some interesting undocumented pins. There is an MS so the dual maps are still available which mean you get 3 modes times 2 map sets. No wonder there are 400+ maps. There is an undocumented EXS pin which is tied to ground like MS. I wonder if this is like the GSXR1000 pin you pull to disable the FI error when you remove the exhaust servo. Any of you guys have the inside dope on that? Does anyone know what the MO- MO+ are for? I'm thinking motorized velocity stacks controller. Also found the reset and Mod0 for programming. Not 100% sure on the programming serial lines yet. It looks like some of the 'Yosh' lines are doing double duty. Unfortunately the way they laid out the silkscreen ID labels for the harness pins it was hard to tell exactly which pin the TXD went to. I'm going to have to trace it out to be sure before I try to flash it. Nice...looks like quite a few outputs that may be able to be reprogrammed.. Here is the Mo+ MO- you were looking for. It appears to be the exhaust valve motor control. I found the information in my 1000 k7, k8 manual. EDIT: I noticed after this post you already found the "Correct" Busa EXhaust valve on different pins. I was able to find what had in the busa manual. Looking at my wiring diagram, there are so many B/W grounds that I wonder if the terminal is an extra trace to up the ampacitiy of the ground circuit. Looking at the 1000 K7, K8 manual I count at least 4 B/W connections to the ECU. One thing the K8 Busa doesn't have is a variable steering damper. On the 1000 K7,K8 the damper has a seperate BR and White wire going to it from the ECM. I would think one wire should be steady state and the other variable. I just found the link to get the K8 busa pdf. repair manual free. Looking at the exhaust diagram above EXS is probably Exhaust Sense, the analog input from the exhaust valve position sensor. I checked it against the input ports but I never tested it as an analog input. Actually on the older gsxr / busa they tied inputs like MS to the sensor ground B/Br so it was easier to differntiate their function. I haven't updated the chart at the top of the thread yet to reflect it but I have definitely identified the wire harness pins that are used by the MCU boot loader to flash the memory. 7 and 30 are wired to the 'Yosh Plug'. If it was me I think I would pull the other two Yosh wires, 55 and 56 and move them over to 25 and 28, if they reach. Then you could use the Yosh plug as a flash plug. stocker any chance you could make this a sticky? Im using the FDT software to connect to device like with my gsxr k5! I think this should be no problem...is the immobilizer blocking the boot mode?!Maybe?! FDT does not support that CPU, it is not same as your 1000 k5. It uses M32R instead of 7052/7054, so you need to flash ecu with EcuEditor instead of FDT. Same goes for 1000 07- and 600/750 08-. As said, send me a mail if you need assistance. All this have been covered several times in this forum. Maybe this ecu is locked from a previous flashing.